Simply Performance is proud to offer a complete V12 stainless steel exhaust system. Our inspiration came when we kept seeing poor quality replacement, pattern or performance systems arriving on cars. 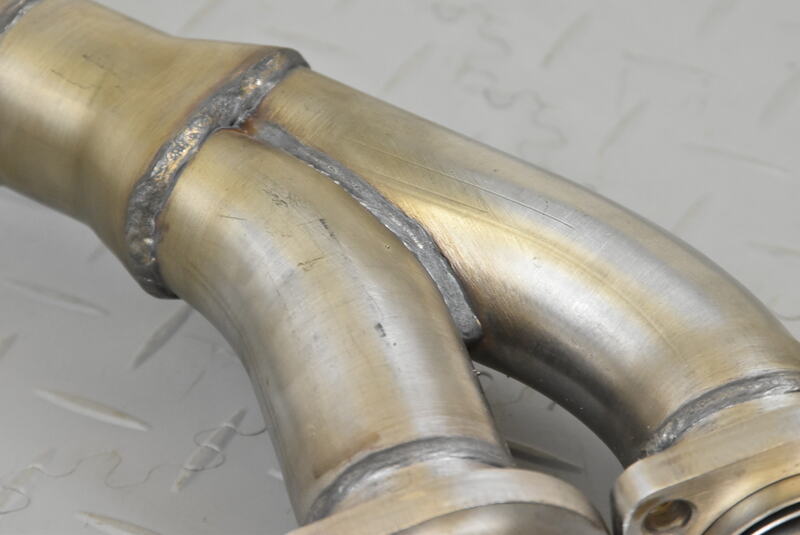 We set about to create a O E specification exhaust system in top quality stainless steel. We have a complete system with is from the manifold back to our hand made tips. The system follows original Jaguar specification, meaning you can install all the parts for the exhaust individually. 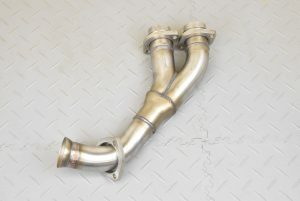 The exhaust is a very high quality and made in 304 Stainless Steel. We offer the full system with a full kit to install with new clamps and olive joints. With the whole system installed you are left with a slightly deeper exhaust note on idle and under hard acceleration you get to hear the engine working. You are left with something that is very suitable for all driving and no loud droning. 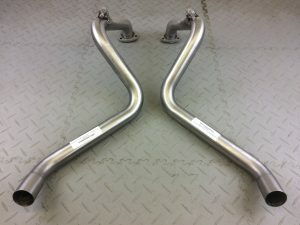 These are Stainless Steel V12 downpipes that have been engineered and manufactured to a high quality. These are made fully butted with virtually no excess which can cause restrictions. Over the years we have seen a variety of aftermarket downpipes available. However, these are made to a poor quality which are very restrictive for the V12 system. Due to the lack of alternatives with Jaguar not currently stocking downpipes, options are limited. We present a case study here of one of the poor quality downpipes that we are comparing our downpipe to. 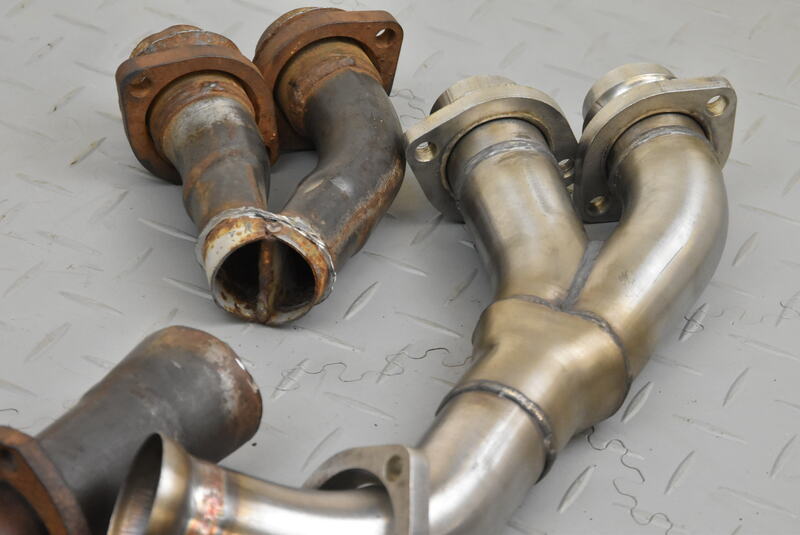 The aftermarket downpipe has poor joins with a large excess of metal that protrudes into the single pipe. With capacity of 1.325cc capacity passing through each pipe it causes great concern how the car can breathe. 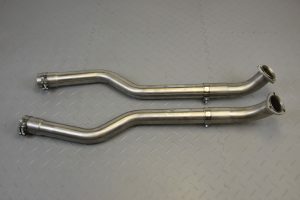 These pipes are compatible with all V12 cars but are designed for a straight bolt on fit for the XJS V12 1975 – 1991 & XJ12 series 3 cars. These are only compatible with non-catalytic cars so for customers with EU and USA spec cars be careful. Although these may be considered expensive at face value; comparable to other aftermarket cheap alternatives these are reasonably priced. Although one of the more simple parts of the exhaust these are a great edition to the complete system. 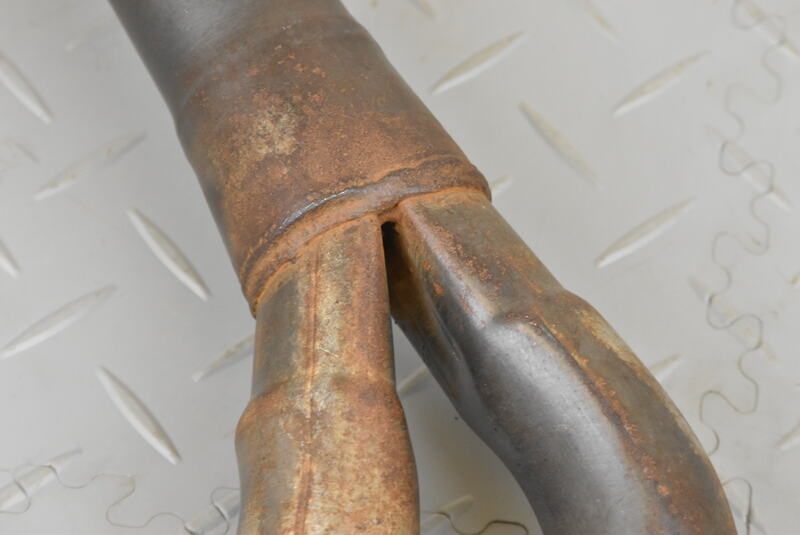 These pipes often can suffer from damage and rust on the original systems. Again these can be fitted within a standard system if you want to replace yours. These can also be fitted to the XJ12 series 3. These can be fitted across a range of V12 models and platforms. Mainly designed for the pre-cat XJS 5.3 V12 but can easily be adapted to other models. They are one of our more basic upgrades that offer a noticeable change. These are to be fitted to XJS’s. They are compatible for V12, 3.6 and 4.0 models. They are not compatible with the very late XJS (AFTER VIN 190528) with slide joints on to the middle box. They are only compatible with the 3 bolt clasp with the olive. These give the engine a lot more breathing space as they are made from top quality Stainless Steel. They are bent to perfection trying to avoid as little collapse of the pipe as possible. These come with the pins that you bolt on to hang them in the rear cage. These are our performance rear exhaust boxes. An all stainless steel rear box that can be fitted within our full stainless system or your original Jaguar system. Our exhaust box livens up the sound and the performance from the car. 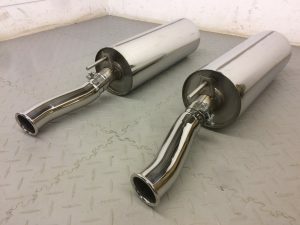 We also make new oversize 2 1/4″ stainless steel exhaust tips to give the car a slightly tuned look without deterring too far from the original design.